On a positive note, you have plenty of betting options, on a multitude of sports and events. As a Bethard customer, you also have at your disposal a multitude of deposit options, including Zimpler and Siru. And if playing on high odds is your game, then you need to know that Bethard offers the best odds in this category. No more going all in with your betting wager. The cash out option is ideal when you think you’d had enough action on your ticket and want your winnings at the very exact moment. Cash Out is easy: you can forfeit a bet during the match and run away with either a nice profit before the match ends, or save some cash on a losing bet. Every online business needs to create a trusted environment where potential customers feel confident in making purchases. Here’s where SSL certificates intervene by establishing a secure connection and therefore trust among parties. Having SSL encryption security, Bethard grants its customers the certainty that their info is not leaked on the Internet. Register now and start betting. For every 100 GBP you wagger, you will receive 5 GBP extra! Repeat 10 times and get up to 50 GBP Bonus! You can forfeit a bet during the match and run away with either a nice profit before the match ends, or save some cash on a losing bet. At Bethard you can bet on a goal to be scored in the next 30 seconds, 1, 5 or 10 minutes during a live match. Follow your intuition! This bookmaker offers 24/7 support to its users! 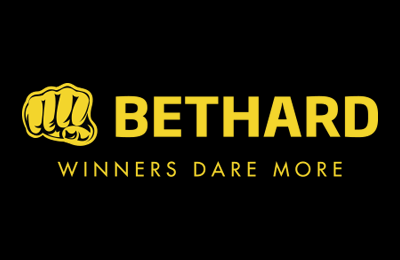 Bethard is one of the newest and most popular entries in the betting industry since they were established in Malta in 2014, but initially went only for the Scandinavian market and concentrated its efforts on a casino. It’s part of the Bethard Ltd, a mother-company that owns sites like sverigecasino.com, norgevegas.com, and suomivegas.com. Sbtech, one of the leading sportsbook providers, provides Bethard with their sports betting platform, making it one easy to use and explore. Bethard owners have gained a license in Malta by the prestigious Malta Gaming Authority as well as Curacao. Yet the biggest confidence asset is Zlatan Ibrahimovic, brand ambassador, as well as co-owner! The Bethard offer for new customers lets you start having fun with more money. Therefore, you can get up to 50 GBP Bonus. To get the Bonus you will need to register at Bethard and start betting. For every 100 GBP you wager, you will receive 5 GBP extra. You can repeat this 10 times, getting a total amount of 50 GBP Bonus. But be aware that there is a time limit – you have 30 days to make your wagering. You should also have the 20 GBP minimum initial deposit in mind. Registering to Bethard isn’t that complicated, but to ensure that you don’t miss anything and have every detail in order, we’ve prepared a step by step guide to help you through the process. First, you start with the most obvious step, by creating an account to get your Bethard bonus. Once you get on the website, just click on the “Create account” button or the “Kickstart” banner, where you can also read about the conditions. If you choose the second option, click once more on the “Get bonus” button. Fill in all necessary information about yourself (e.g. name, address, date of birth, mobile number, email). You will afterward need to choose a username and a password. While an easy to remember password is recommended, it’s always better to pick one that is also strong and hard to crack. If you want to receive marketing materials related to new promotions and special events offered by Bethard, you can get them via email, SMS, or Phone call by using one of the three checkboxes for this purpose. The final step can be done by clicking on the green button: „activate account”, with an activation code you can receive through email or phone. Before you can make use of your bonus, deposit the minimum required by the bookmaker, which in this case is 20 GBP. Keep in mind that for every 100 GBP you wager, you will get a 5 GBP bonus. The Bonus itself is wager free and can therefore be withdrawn instantly. For example, if you wager 200 GBP, you’ll have 10 GBP in your account. You can withdraw this 10 GBP immediately. As there are no wagering requirements sticked to the Bonus, you can withdaw it directly after receiving it. But there is a catch. Each selection must have 5/1 odds and the Combo Winnings Boost promotion is valid for bets placed on full-time 1X2 and both beams to score football markets. Also, check out the Fantasy Premier League game offered by Bethard, with prizes every week. During the World Cup, we had the Zlatan challenge, and we’re sure Bethard will try something similar very soon. Bethard’s website is easy to use and you can place your bets on 29 different sports, including popular sports like football, basketball, tennis or hockey. American football, handball, and baseball are also present, but Bethard betting can be just perfect for those who are sick and tired of putting their money on mainstream sports. The Dota 2 International may be over, however you can still bet on eSports. Golf, badminton, cycling, chess or cricket are other options that are not that popular among most people. Returning to football, you have there on every single match up to 130 different betting options, including Asian Handicaps, special bets, combo betting selections, additional under/over lines and almost every other wager you might think of. Sure, the leagues and events of the less popular sports mentioned above are not covered as well as the most popular ones, but it’s refreshing seeing them up there. The best part about being a Bethard new customer is getting to know the odds, which are just awesome. The Premier League is the most popular league and the odds for the first division English football stack together for a total book percentage of around 101.5% to 102%. For tennis, the margins on matches are incredibly small, with odds stacking up at 101.5% to 102% for the win market. Results, statistics, betting rules and many other details can be found on the left side of the main page, so you have every bit of information at your disposal to have a pleasant experience at Bethard. The minimum bet is 0,10 GBP, while a maximum bet is not determined. However, it is possible for Bethard to impose certain betting restrictions on clients that have the tendency of placing a huge amount of money on the same markets. The general payout is over 94%, with basketball being the most popular spot that gives away payout grosses. Bethard is one ambitious sportsbook that recently got its license to active in Denmark also. It’s expanding and people working there are very involved to offer the customers the best experience they can have on a gambling website. The odds are incredible, the offer is wide, proper for every type of betting fan, and you have a 24/7 capable customer service. It’s a tough industry, but the Swedes are doing it and the Bethard bonus is motivating to quickly sign up and play on the website. Bethard introduced interesting betting concepts such as the Zlatan Challenge and will further go on this line, surprising its customers. Starting with credit card payment (Mastercard and Visa), Bethard has all the classic options of filling your account – Neteller, Skrill, Paysafecard, and two others not that popular, Zimpler and Siru. Each has a minimum deposit of 10 GBP, with no fees attached to any deposits or withdrawals except credit card deposits, which come with a 2.5% fee attached. All transactions are secured by SSL in order to protect your money and data, so you don’t need to worry about that. Sometimes the “cash out” option is a life saver. If you want to cut your losses or maximize your winnings, a simple button can do the trick. However, you should know that it’s not always available and depends on any changes in the price or market during the course of an event. Therefore, it could result in a new “cash out” offer or the option could remain blocked. The option isn’t available on Forecast/Tricast Bets. It might be required to verify the betting account before the first cash out, but it’s a procedure you are obligated to do before making your first withdraw, so there’s no point in delaying it. A downside to Bethard’s customer service is that it doesn’t have phone assistance. But otherwise, the Swedish bookmaker offers 24/7 help for its customers through email and live chat. You can contact the team via email at support@bethard.com. The Live Chat option is easy for the eye as there is always a tab at the bottom of the screen that opens up when clicked. Therefore, whenever you’re on the website, you’ve got your problems covered by an amazing customer service. Also, the website has an FAQ section, where you can find solutions for main issues. The agents are quick and helpful, so you won’t have to wait too much in line. The Bethard customer service is available in five languages: English, Finnish, German, Norwegian and Swedish. It’s 2018 and social media is part of everybody’s life, connecting people all over the planet. And Bethard wants to be close to its customers, so it’s quite active on Facebook, Twitter or YouTube. It also has a blog, where they post news about the latest transfers or engage in betting predictions. Reliable or scam: How safe is Bethard? Although Bethard is a new entry in the betting industry, born in 2014, being part of the mother company Bethard Ltd is certainly a plus. Afterward, it’s the license awarded in Malta by the prestigious Malta Gaming Authority as well as Curacao, that proves you’re dealing with a serious presence in the gambling industry. Swedes and Nordic people, in general, are well-known for their seriousness and effectiveness and Bethard is no exception, having the right arguments to become a top bookmaker in the near future. How to get the Bethard bonus? Create your account and deposit a minimum of 10 GBP to get the 100% bonus offered by Bethard on your first deposit, up to 100 GBP. Do I need a Bethard bonus code? No, the bonus is awarded as soon as your deposit is registered. However, deposits made with Neteller/Skrill and Paysafecard will not qualify for this campaign. Which requirements should new customers pay attention to? You should pay attention to the fact that there are different wagering requirement and contributions depending on which product you play in order to transform your bonus into real money. For example, for sports is four times your deposit + bonus. Also, keep in mind that you have only 30 days to complete the wagering requirement before a withdrawal can be made. Is there a mobile Bethard bonus? Not for now, because Bethard is still trying to put out a competitive app for mobile and different devices. But the Swedish bookmaker often catches us off guard with different bonuses and offers.